6. Check fuel supply. Make sure you have enough. Charcoal briquettes add a certain piquancy, but for even more petrochemical taste and aroma soak your wood, charcoal, or bitumen in charcoal starter, napalm, or even gasoline (damn the expense). Do not add gasoline to burning fires or glowing coals, even if you feel you have protected yourself by consuming sufficient beer. 7. Ignite fire. Don welding apron, Kevlar™ gloves, safety glasses; reverse baseball cap or the bill will burn and trim your hair. Apply flame to fuel and accelerant, then quickly extinguish eyebrows and footgear. If you are cooking over a propane gas burner or using an electric deep-fryer, get medical treatment for low testosterone level immediately. Fires are hot; remember to consume enough beer to keep cool. 8. Ensure that your annoying neighbor is downwind of your fire.Give the jerk something real to grumble about for a change. He won’t complain to you, of course – no Real American Guy would embarrass himself like that or disrespect the sacred nature of Male Outdoor Cooking. If he makes a fuss, report the wimp to the authorities as an illegal alien terrorist and/or sexual deviant. Continue consuming beer to keep cool and avoid dehydration. 9. Cook. Allow fire to settle into glowing coals before using crane to hoist container of cooking oil over grill or burner. If you have been too impatient to allow fire to settle into glowing coals, extinguish oil fire and repeat. While waiting for fire to settle into glowing coals, prepare turkey by sprinkling it with salt, pepper, and/or the Deep-Fried Turkey Sprinkle you bought at Home Depot, or brush, air-brush or inject that Home Depot Deep-Fried Turkey Sauce. 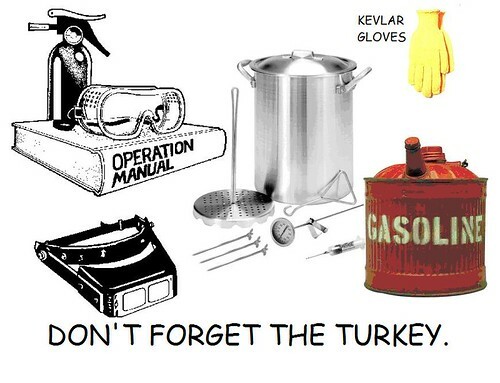 Remember to leave room in the oil container for turkey and perforated container, as these displace hot oil; if you forget, extinguish oil fire and repeat Step #9. Consume beer to replenish vital fluids and keep cool. 10. Remove turkey when done. The Deep-Fried Turkey Doneness Formula is simply Time = (weight of turkey) ß/Σ (altitude) x 2. Remember to adjust for barometric pressure and the specific gravity of your particular oil medium. If you think of turkey weight in kilos, knock on some doors and get a real American to help you. You can calculate Deep-Fried Turkey Doneness more easily with a meat thermometer: Remove turkey ten minutes after meat thermometer melts. Alternative method: Turkey is done when a 200-pound American male cook has consumed 216 fluid ounces (one gallon plus five-and-a-half pints) of beer (Caution:If you think of this as 6.39 liters, see above). 11. Allow turkey to drain and cool before eating. Do not blot with shop rags, as these often contain metal shavings and will ruin dinner; do not dry with those little towels from the guest bathroom (using those for anything is grounds for divorce). 12. Call KFC. Order several buckets. What the hell; a good time was had by all. Need a cold one? Disclaimer: The above is provided for amusement, not actual cooking. NotionsCapital is not responsible for interpretations by the humor-impaired, mentally challenged, or emotionally disturbed. If English is not your native language, please ignore this post. Yes, we are aware that people are badly injured while improperly deep-frying turkeys and that consuming deep-fried foods is not considered healthy, so keep it to yourself. Jeez, what a country. This entry was posted on November 23, 2016 at 12:01 am and is filed under cooking, cuisine, food, holidays, men, poultry, public safety. You can follow any responses to this entry through the RSS 2.0 feed. You can leave a response, or trackback from your own site.